Amped is the first snowboarding game focused on the fun of open freestyle boarding down real-world mountains like Utah's Brighton, Vermont's Stratton, and California's Snow Summit. Make your way down the mountain however you chose to. With a huge variety of rails, kickers, and terrain, you'll experience a completely different ride on every run in your bid to show off to the right spectators and become the next snowboarding media star. 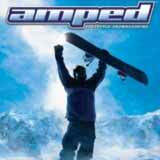 Amped features jaw-dropping graphics, real-mountain resorts and over 120 wide-open mountain runs. Open Freestyle Riding. Forget miles of barren wasteland and tight tunnel racers. Trick off of a huge variety of jumps and rails on wide-open mountain runs. Spectacular Real Mountains. Ride the runs on real mountain resorts: Utah's Brighton, Vermont's Stratton and California's Snow Summit. Be a Snowboarding Media Star. Earn exposure points to become one of the World's top10 snowboarding media superstars. More In-Game Choice for Maximum Replayability. Make your gameplay choices on the mountain, not in a menu of disconnected events. Start at the top of a peak and decide how you want to win.